Vitamin C is water soluble and among the most fragile of our nutrients. It is easily destroyed through traditional methods of food handling and preparation. Soaking, cutting, steaming, baking and boiling all are detrimental to the structure of this important vitamin. Time also depletes vitamin C content; time in the grocer’s produce display, time in the refrigerator, time in the pantry. During each hour from harvest to consumption, these vital nutrients are being lost. Most animals can synthesize their own ascorbic acid; however, humans are not as fortunate. We must consume what our bodies need each day to maintain overall well-being. Vitamin C plays a role in maintaining connective tissue and is an integral part of collagen, the “cellular cement” that holds our cells together. It helps maintain healthy teeth, gums and skin. Many nutritionists feel that established daily allowances of vitamin C are barely sufficient to meet our needs. Some people may require very large amounts to deal with specific burdens present in their lifestyles which increase vitamin C demands. Lifestyle demands and cigarette smoking rob the body of this precious vitamin. People who sustain regular minor physical challenges (athletes, some construction and industrial workers) may need extra vitamin C. A water soluble antioxidant, that in fact, we all may need greater quantities daily as our environment continues to become more toxic. The earliest deficiency symptoms are usually bleeding gums and loose teeth. 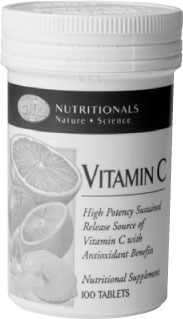 Prolonged lack of vitamin C can result in the potentially fatal disease scurvy, characterized by an overall weakening of the collagenous structures of the body. Marginal deficiencies may go unnoticed for years and could contribute towards a general erosion of overall well-being.